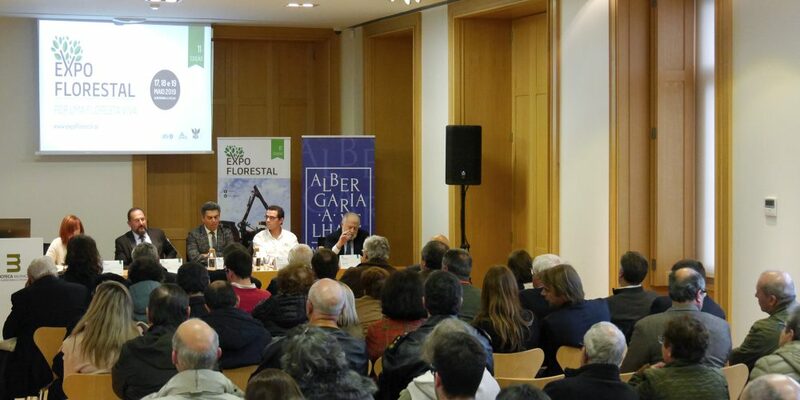 The opening session of ExpoFlorestal was attended by a large interested audience, gathering players of the agroforestry sector for a fruitful evening of discussion. Professor Daniel Bessa reminded the necessity of government verification, or even regulation, of the prices of raw forestry materials, and he drew attention for the possibility of more development in the production of minority species. Luís Sarabando talked of the spirit of coordination among Portuguese forestry players, reaffirming the determination of the sector in collaborating with the relevant political and economical bodies. Miguel Freitas, Secretary of State for Forestry and Rural Development, explained the different ongoing policies as well as the ones to be implemented in the sector, with the objective of solving difficulties for its agents and of improving planning and management of agroforestry areas and resources. The session was presented by the Mayor of Albergaria-a-Velha, António Loureiro, with the moderation of Sandra Valente from Universidade de Aveiro.